Ambergris Caye, Belize, June 3, 2017	(Newswire.com) - When it comes to purchasing foreign properties, it can be quite difficult for some to find the right property vetting company to assist you. Getting the right vetting company is very critical to deriving value from your foreign real estate investment and it is very important to take some time to carefully analyze and verify the authenticity of the listings offered by the real estate vetting company you choose to deal with. The same advice may be applicable when purchasing real estate in Belize, as there are many deals in the market that can be puzzling for most foreign buyers. The property investment terrain in Belize is presently rife with multiple investment deals closing by the day and with millions of Americans discovering this tropical paradise and looking to make it their retirement destination, the opportunities open to investors are endless. One major factor however which most real estate companies in Belize have lacking is the ability to match foreign buyers to properties based on their backgrounds and interests, and to determine the exact purpose which the property they are looking to purchase will serve. There are lots of instances where foreign buyers miss out on great opportunities to purchase prime properties in Belize due to the many ambiguities involved and the sloppiness of the real estate company that is vetting the property. Coldwell Banker Ambergris Caye – Belize’s number one real estate company specializes in helping foreign buyers vet and assess the various real estate opportunities available in Belize and have made it very easy for foreigners to purchase prime real estate in Belize. We are adept at vetting and closing great property deals for foreigners in Belize and have made the property vetting puzzle a whole lot less complicated and much more affordable for foreigners. We are your go-to real estate development company that caters to every aspect of your property investment interests in Belize, whether you are clearing in as a tourist or as a full time resident. There are lots of interests which most foreigners love to indulge in when they arrive in Belize and we understand them all – from museums to beaches and dining to the marina, we have expertise in helping buyers vet and assess every opportunity available in each area. One of the many great property deals that is presently being offered up for sale and also worth giving a shot at is the magnificent 362 acre canal front development project located only 10 miles from the Belize International Airport. This prime property is presently available to interested investors for $3,500,000 and has a potential 329,360,000 US net profit with initial investment of just over 10 million including outright land purchase. 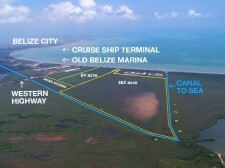 It is within 20 minutes’ drive from the Belize international airport and features 2 miles of easily navigable canals which lead up to the Caribbean sea. The property is in close proximity to several major amenities including 3 large hospitals and supermarkets that are only 20 minutes’ drive away. The National Highway and all the utilities are very close by, it is also located 4 miles from the tourist village-cruise terminal, a mile away from the largest marina in Belize and very close to the cruise ship port which is a budding hot spot for tourist entertainment. It is a great buy for the proactive foreign investor and developer looking to attract tourists and locals with development possibilities of a museum, restaurant, beach, waterslide, marina, etc. in the area. Wherever your interest lies, you can make it all come to life in this incredible piece of real estate – land banking, residential development, a tourist entertainment park, you name it. It is also a very valuable opportunity to introduce a gated community in the area, as Belize currently does not have any gated community yet. There are also community features like boating and public transportation. The magnitude of profit to be derived from this property is very enormous and the lucky developer who is smart enough to take advantage of this great opportunity is guaranteed to enjoy brisk sales from it. The sellers are motivated and will accept terms. Contact Coldwell Banker today and let us be your guide in vetting that property you want to buy. We will also help you assess the several other opportunities available and provide you with a choice that bests suit your needs and interests.